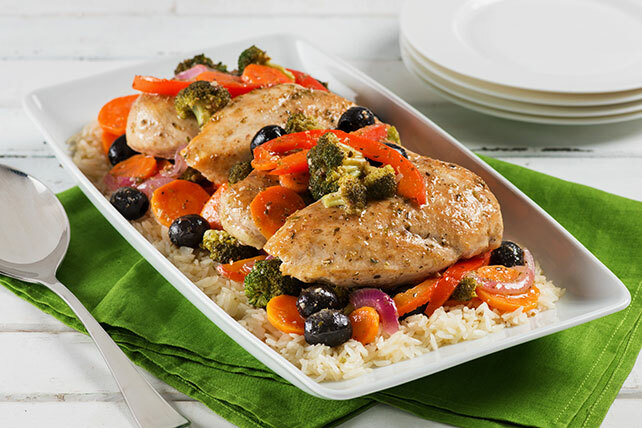 Serve this Greek chicken with rice, crisp tender veggies & black olives. Greek Chicken and Rice Dinner is the next best thing to dinner on a Greek island. Heat 1/4 cup of the dressing in large skillet on medium heat. Add vegetables; cook and stir 15 min. or until vegetables are crisp-tender. Remove vegetables from skillet; cover to keep warm. Add remaining 1/4 cup dressing to skillet. Add chicken; cook 7 min. on each side or until chicken is cooked through. Return vegetables to skillet. Add olives; stir gently until well blended. Substitute 4 cups frozen vegetables, thawed and drained, for the fresh vegetables. Cook and stir in dressing for 5 min. or until heated through. Remove from skillet and continue as directed.